New John Wick 3 Trailer Highlights Friends and Foes | Nerd Much? 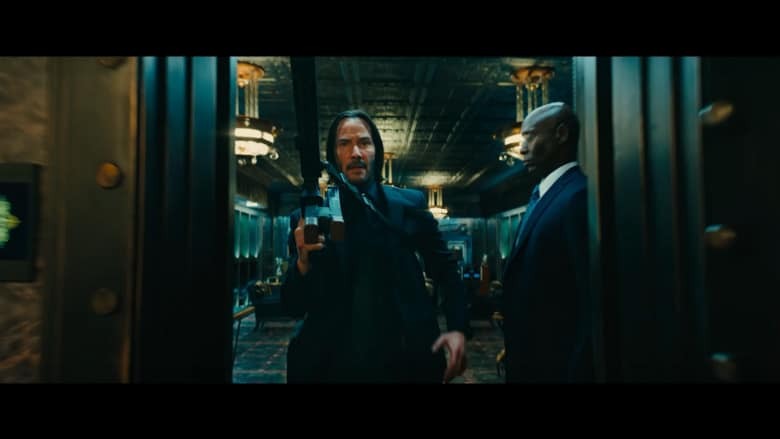 The first John Wick: Chapter 3 – Parabellum trailer that released in January teased the events that occur just after the second movie’s conclusion. But today’s new John Wick 3 trailer shows us just how far Wick’s quest for survival will take him. It begins with Ian McShane’s Winston voicing over the trailer with “You have no idea what’s coming” while we see Wick running through the rain with his pup by his side. We then cut to some obligatory action shots, before Wick apparently escapes and seeks out the assistance of Halle Berry’s Sofia. She shoots him immediately, but Wick’s suit stops the bullet from causing any damage. This results in Sofia lightheartedly paying the attire a compliment, to which John is less than amused. We then see Anjelica Houston’s The Director telling Wick remorsefully that “there’s no escape for you. The High Table wants your life.” Knowing this, we then move over to an exchange between Winston and Wick, with the latter asking if “services” are still available to him. Winston obliges with a smirk, opening a vault of weaponry that we’ll all gleefully see Wick experiment with. The new John Wick 3 trailer ends on a bit of a comedic note. Wick is walking with The Director when she asks “All of this for what? Because of a puppy?” He responds, “It wasn’t just a puppy” before dispatching a few more foes as the trailer ends. John Wick: Chapter 3 – Parabellum shoots into theaters May 17th. But other awesome yet underrated action flicks, checkout Nerd Much?’s full list here.